The uses of livestock confinement systems and large capacity, on-farm, liquid manure storage facilities have become well-established practices throughout Indiana. The primary advantages of liquid manure storage facilities are that they make the waste handling process less demanding on your time and allow for applications of manure on croplands at more convenient or appropriate times. In general, there are three types of liquid manure storage systems being used. * Large manure storage tanks located directly underneath the livestock housing area. 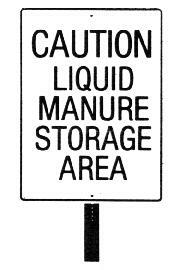 * Manure storage located away from the livestock housing areas in open lagoons or ponds. * Above ground, silo-type, manure storage structures. 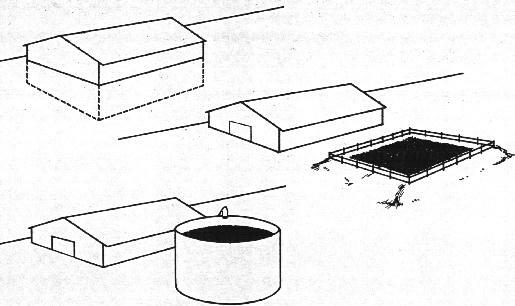 In all three types, the manure is flushed from the livestock housing area with added water and then agitated by various means to form a liquid slurry. This slurry is then pumped periodically from the storage area into applicator tank wagons or through irrigation systems for application on cropland as a valuable fertilizer and soil conditioner. When animal waste of any type is being stored in large quantities, a number of hazards are present for both man and animal. The most obvious hazard is the potential danger of falling into one of the large open storage areas and drowning. There is also the danger from gases which are produced as the manure is decomposed by bacterial action. During the decomposition process, a variety of gases are released which can be hazardous to both people and livestock. The most common of these gases include: ammonia, carbon dioxide, methane, and hydrogen sulfide. Knowing the nature of these gases and the effects they might have on you should reduce the potential risk of working around manure storage areas. Ammonia (NH3) is a strong alkali which has a sharp characteristic odor found also in common household ammonia. In low concentrations, 1 percent or less, it can irritate the eyes, nose, and throat. Concentrations as low as 3 to 5 percent can cause harsh coughing, and severely irritate the eyes, throat and lungs and has the potential of being fatal. Flushing irritated skin or eyes with water is the best first-aid treatment. Carbon dioxide (CO2) is an odorless, nontoxic gas, which is part of the air we breathe. Yet, in concentrations of 3 to 6 percent, it can cause exposed workers to have labored breathing, drowsiness, and headaches. A 30 percent or higher concentration can cause death by suffocation since it replaces the oxygen available for breathing. In addition to manure decomposition, carbon dioxide is also a byproduct of livestock respiration. Methane (CH4), a highly flammable, nontoxic gas is also released during the decomposition process. There are reports of a confinement building being blown off its foundation when a pocket of methane beneath the structure was ignited by sparks from a welding operation. Asphyxiation is also possible in a confined space with a high concentration (5 to 15 percent) of methane. Methane is extremely difficult to detect without gas detection instruments because it is odorless, but it should be anticipated as being present in all manure storage areas. Hydrogen sulfide (H2S) is a very poisonous gas having a readily recognizable "rotten egg" odor. A concentration of only 50 parts per million (comparable to only 3 pounds of sugar mixed with 62,500 pounds of salt) can cause dizziness, irritation of the respiratory tract, nausea, and headache. With concentrations exceeding 1,000 parts per million, death from respiratory paralysis can occur with little or no warning. Only recently a 16-year-old Wisconsin farm worker, collapsed and died while cleaning a confinement calf barn located over a 100,000 gallon liquid manure tank. Hydrogen sulfide was reported as the cause of death. The manure tank was being agitated at the time and only one of the five ventilating fans in the facility was being operated. There is also a report of a young boy climbing into a manure tank wagon to remove accumulated manure and succumbing to hydrogen sulfide gases trapped within the tank. Hydrogen sulfide is considered the most dangerous of the by-products of manure decomposition. Both carbon dioxide and hydrogen sulfide are heavier than air, and will tend to settle to the lower areas of the storage facility and remain in high concentrations even after ventilation. * Know the physical effects of the various gases released during manure decomposition. If at any time these effects are detected, it is critically important that both workers and livestock are evacuated from the area or ample ventilation provided. * Maintain adequate ventilation in all confined areas where livestock are housed or livestock waste is stored. This is especially true if the manure is being agitated, since agitation causes a rapid release of gases. Even with the facility's ventilation system operating, high levels of toxic gases can accumulate quickly. Ventilation recommendations are available from a number of sources including your local Cooperative Extension Educator. *If the power fails, open all windows and doors and remove livestock if possible. Many farmers with livestock confinement operations have invested in portable or emergency power generating units to insure livestock housing areas continuous power for ventilation. 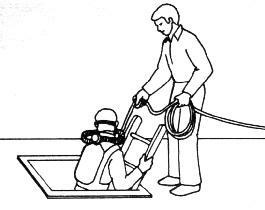 *Wear a self-contained breathing apparatus and safety rope with a second person standing by if you must go into a liquid manure storage tank. Most specialists generally agree that there are very few legitimate reasons why anyone should have to enter a manure tank. 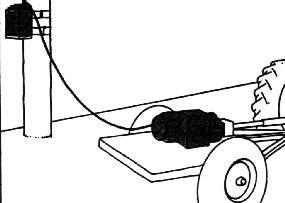 Entering one without an adequate air supply can be fatal. *Since a methane/air mixture can be highly explosive, prohibit smoking or other open flames in confined housing or manure storage areas. Table 1. Manure gases: characteristics, effects and first-aid measures. ing at high con-	with water. Dioxide			  than air         headaches. Can	air. 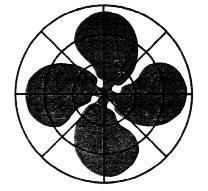 (CH4)			   air		   be asphyxiating. air. Sulfide	     rotten eggs   air		   Causes headaches,	air. Concerning open storage of liquid manure in ponds or lagoons, precautionary measures should also be taken to reduce the risks to people and livestock. * Manure ponds or lagoons should, if at all possible, be fenced in to prevent access by children or livestock. Open lagoons can appear deceptively solid during warm weather and lure the curious out onto the surface. * Signs should be posted around the perimeter of the lagoon providing a clear warning of the existing hazards. The National Institute of Occupational Safety and Health estimates that about a dozen farmers have lost their lives and many more have become physically ill by the effects of manure gases. Furthermore, there are, roughly estimated, 50,000 swine confinement facilities located on family farms throughout Indiana in which a potential overexposure to manure gases could occur. Therefore, the need for local emergency rescue and medical personnel to also have a better understanding of the hazards of manure gases is evident. Rescue attempts made in and around livestock confinement facilities and liquid manure storage areas should be undertaken with extreme caution. Full respiratory protection, in the form of self-contained breathing units, should be utilized at all times. No one should ever enter a manure storage pit - even to rescue a victim overcome by gases - without a supply of air and assistance from a backup crew using a lifeline. Ventilation should be restored to the facility as quickly as possible by opening windows and doors, reactivating the facility's ventilation system, or in an emergency, utilizing portable smoke evacuation equipment. Now is a good time to evaluate your livestock waste handling system to identify potential hazards to yourself, your family or your livestock. Removing or guarding hazards and being prepared for emergencies are wise farm management decisions. AE-98 Manure Pit Ventilation in Confinement Livestock Buildings, Purdue University Cooperative Extension Service. Cooperative Extension work in Agriculture and Home Economics, state of Indiana, Purdue University, and U.S. Department of Agriculture cooperating; HA. Wadsworth, Director, West Lafayette. IN. Issued in furtherance of the acts of May 8 and June 30, 1914. Purdue University Cooperative Extension Service is an equal opportunity/equal access institution.